Karina's Kreations: Stampin'Up Flurries of Wishes! Stampin'Up Online Extravaganza runs until Nov 28 and on Nov 28 the Flurry of Wishes stamp set and punch is on sale for $39.60. 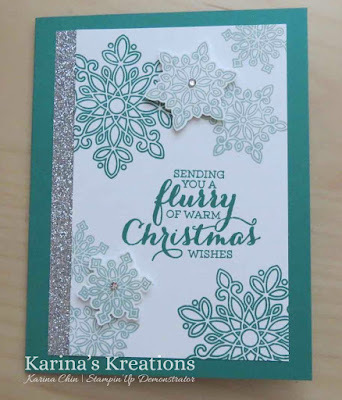 I made this cute card using the Flurry of Wishes stamp set and punch. As a special thank you for orders this week, I'll mail three stamped cards to you.